A Correction ← You Want Me To Wear What? Last week, I posted an indignant rant about the differences between an herbivore and a vegetarian, and why dinosaurs are not vegetarians. I also said that, had they made a matching shirt with “Carnivore” written on it, I would not have objected to the shirt. That being the case, it seems the “Vegetarian” t-shirt previously written about is not a dinosaur-themed article of propaganda, but instead, it’s just inaccurate. I stand corrected. 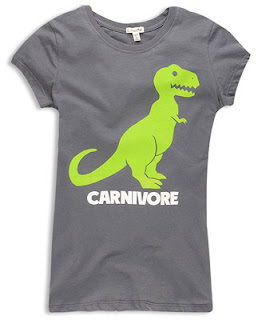 And, true to my word, I bought the carnivore t-shirt. Because come on – dinosaurs are awesome.